Our team organized a FTC move-up day for the 8th graders wanting to come up and join our team in the next coming year. We gave them a tour of all aspects of our team and answered any questions they had about FRC or our team. Girls from the Bionic Black Hawks were invited to present at the International Day of Women and Girls in Science at the United Nations, with the objective to spread awareness about the benefits of FIRST robotics programs for girls and boys. There were six female presenters who shared their personal experiences with the United Nations panel. Last year we started a TV show called Full S.T.E.A.M Ahead. The motivation for the show is to help teachers bring STEAM to elementary school students. The show allows us to illustrate STEAM concepts by filming experiments performed by professional that demonstrate fundamental concepts difficult to perform in a classroom. The show is 100% student produced/ filmed/ edited and is viewed in schools, on community cable TV channel, and worldwide on youtube and can be accessed through our team’s website. 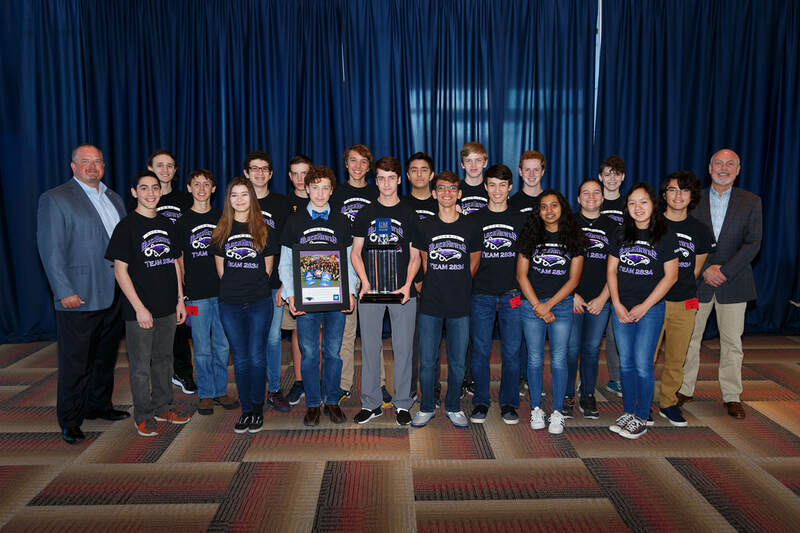 The Bionic Black Hawks continue to be active in mentoring FTC, FLL, and FLL Jr. teams. 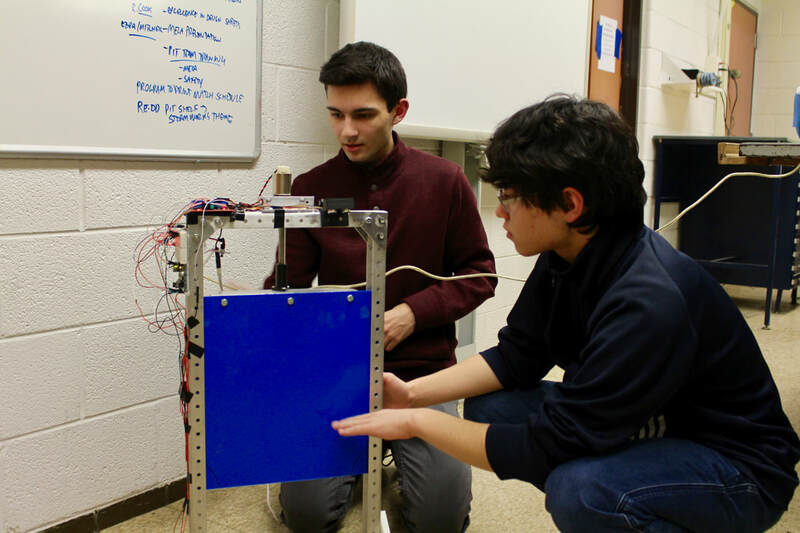 During the season, our members serve as mentors to our 14 FLL & 8 FTC teams, joining them weekly for programming, build and strategy, and more, resulting in over 1000+ mentor hours. 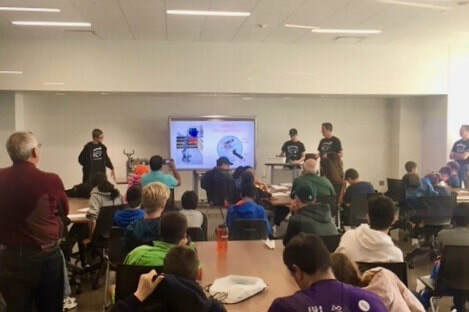 At the end of the season, we host week-long FLL and FTC camps, and numerous demonstrations and parent meetings to manage the progression of students and teams to the next level. For a second year we partnered with the Charles L. Bowers School Farm in our district to apply the engineering and robotics skills we’ve learned in FIRST to solve real-world agricultural challenges. Last year, we built an autonomous door for the chicken coup that used light sensors to detect sunrise and sunset to open and close the door. This helps reduce work for the farm attendant who used to manually open and close the chicken coup door every day. This year, we are designing a programmable pig feeder that can dispense the desired amount of feed each feeding time in order to reduce feed contamination and wastage by vermin in the farm. This also reduces work for the farm attendant. 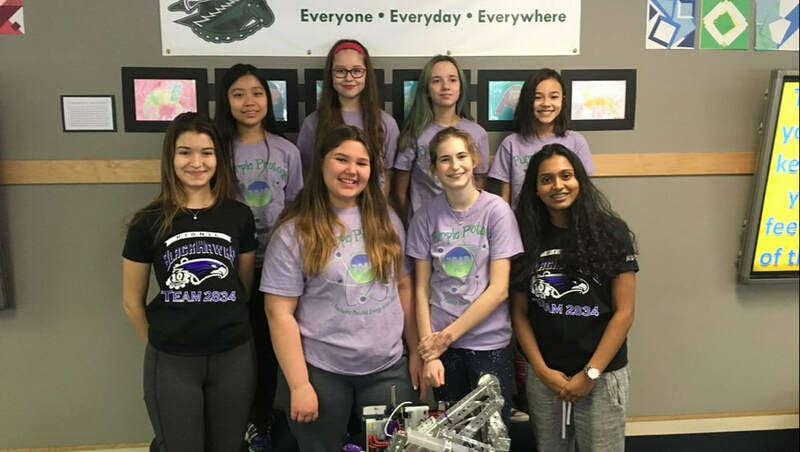 Girls from the Bionic Black Hawks and Bloomfield Schools FTC 7048 Purple Protons wrote to the Royal Academy of Science International Trust (RASIT) informing them of the empowering experience of girls in FIRST Robotics. Our girls have been invited to attend the International Day of Women and Girls in Science 2019. Our goal is to help spread the awareness of the benefits of FIRST robotics programs for girls and boys all over the World by using the United Nations platform. We were chosen as GM’s, “2017 Team of The Year,” at the World Championships. This award, celebrates “great examples of successful GM teams.” As recipients of the award we were invited to participate in a “GM Cares” event. We, along with other GM sponsored teams, demonstrated our robot and talked to GM employees about our experience with FIRST with the goal of encouraging GM employees to help start and mentor FIRST teams. Since 2015, we started our advocacy team by traveling to Washington DC to participate in the FIRST National Advocacy Conference (NAC). In May 2017, our team participated in the Michigan Advocacy Conference in Lansing where they discussed the benefits of FIRST and asked representatives for their continued support of FIRST funding in Michigan. The Black Hawks met locally with Rep. Mike McCready and were excited when he attended our FRC kickoff event in January 2018.